BTW, be sure to stop by Monica’s blog for her giveaway! She is giving one of her beautiful paintings to some lucky (hopefully me:-) winner on the 28th. What a face! I love it, such expression and character. I always enjoy my visits to your blog. Thanks for sharing your art. The cat is fun, mine are sleeping on my couch, I thinks I will take a cat nap with them!! 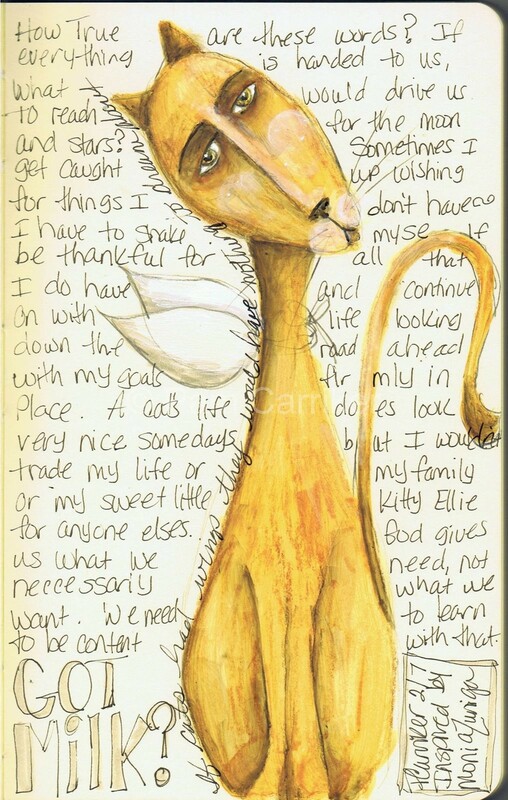 I hope to take one of your on-line classes, especially art journaling. I follow all the publications on your blog! Can never get enough! Hi Pam, thanks for the honesty! :)I appreciate it! Even though you are an amazing artist you do talk about your sources of inspiraion and that is just wondeful!I love your Kitty, the face is so beautiful, I love your journals, they always bring me inspiration!Have a wonderful day!Moni. You know Pam the eyes are just like your ladies…the pammiecat! Love your cat, Pam. Monica’s work is great and I actually have one of her prints in my 1/2 bath that is decorated in all cats.